My dear friend's birthday is this Thursday and I am late getting her a card :( I made this one today based on a sketch at What's Scrapping? I also did this card for the May Scrap Your Crap at The Scrapping Spot. 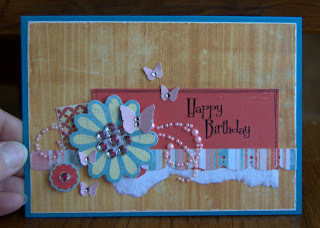 I'm dying to dive into the new May kit from The Scrapping Spot, but until then I'll settle for getting a card done. Labels: Cards, The Scrapping Spot, What's Scrapping?